Performers include: Michael Chiklis, Catherine Dent, Walton Goggins, Michael Jace, Jay Karnes, Benito Martinez, CCH Pounder, Cathy Cahlin Ryan, and David Rees Snell. 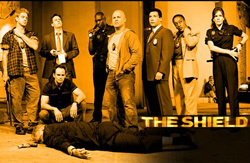 A police drama known for its controversial and gritty portrayal of corrupt police officers. The fictional setting is “The Farm” district of Los Angeles. “Strike Team” leader Detective Vic Mackey (Michael Chiklis) and his team of four use a converted church called “the Barn” as their station. Episodes show the team often using both illegal and unethical means to maintain peace on the streets. Subplots focus on personal lives, conflicts and relationships of the characters. First aired: November 25, 2008. There have been discussions of a possible movie or a possible spin-off (see news articles below) but there are no concrete plans as yet. The Shield: How Will the Series Finale End for Vic Mackey? The Shield: Vic Mackey May Live On in Movies! The Shield: A Spin-off for the FX Series? The Shield: The End Is Coming, But Not Soon!